Having spent most of my professional working career within the confines of a cubicle, I think I have a little bit of experience when it comes to the best ways to hang anything from a cubicle wall. This article will delve into what I feel are the Top 5 cubicle hangers to fulfill your cubicle-hanging needs. Believe me, this is not a comprehensive list of all of the tools or devices that you can use to hang items in a cubicle, but they are the ones that I have used and continue to use in my own cubicle. Here are my Top 5! Yeah, push pins are always good to have in a cubicle. Thanks to the fabric of the cubicle walls, you can always press them into the fabric to hold up papers or notes. You’re probably not going to be able to hold many papers at one time because they probably won’t grab as well as they would in a cork board. 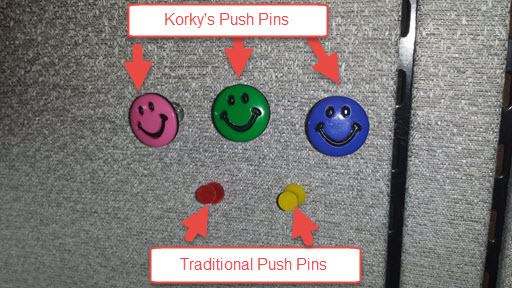 A while back I picked up some Korky’s Retro Smiley Face Push Pins that you can see above. 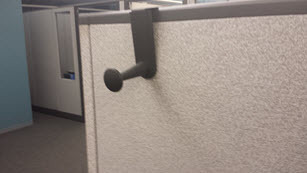 They are really well made cubicle hangers and take push pins to another level! Click here for the 94 different types of Korky's Push Pins including motorcycles, sunglasses, flip flops, baseballs, hockey pucks,lucky clover,football, soccer balls, etc. Any type of push pin is a nice addition to any office but they are great for cubicle walls in particular. Just recently I came across some really cool Geometric Wood Push Pins that are certainly unique and would be great for anyone who wants a truly unique office accessory. I lump cubicle hooks, panel wall clips, and panel wire hooks in together because they are essentially the same where two have an actual hook and the other is a clip. I have all of these in my cubicle and utilize these cubicle hangers throughout my office. 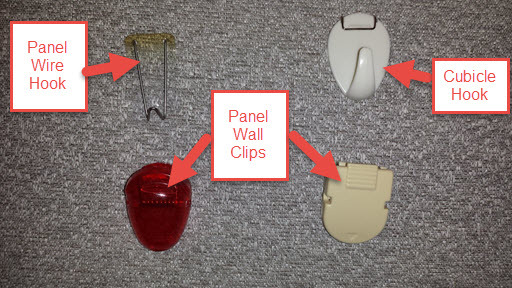 I wrote this article about the usage of panel clips in an office cubicle a while back. All of them typically utilize stainless steel needles to grab into the cubicle walls as do many of the products that I have featured on this website including my popular cubicle shelf, pencil cup, note rail, cubicle utility bowl, cell phone holder, etc. 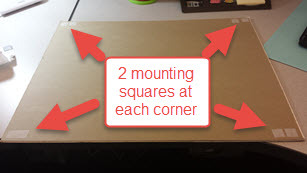 Have you ever even heard of mounting squares? 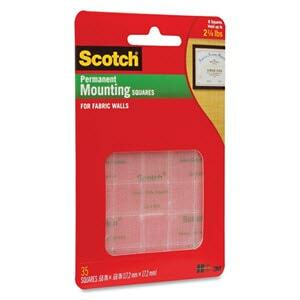 Well, I hadn't up until a short time ago but I did pick up some Scotch Mounting Squares for Fabric Walls recently. There are many different types of Scotch Mounting Squares which can be seen here. 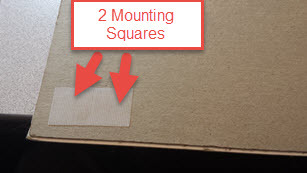 The mounting squares for fabric walls have an adhesive side that affixes to the back of your picture or poster. 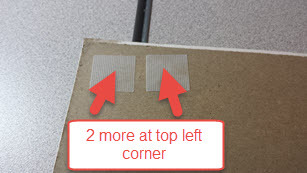 The other side is very similar to velcro and when you press it onto the cubicle wall and slightly pull down as you do so, the velcro-like material grabs into the fabric of the wall. Move onto the next corner. Press firmly onto fabric cubicle wall. The poster holds firmly onto the cubicle wall. This poster is fairly light. The maximum frame or poster weight recommended is 2 1/4 lbs which should satisfy most of your needs as far as posters, pictures, and frames are concerned. You can use some of the other options in this article for hanging heavier items. Since there are so many different types of specialized cubicle hangers available in the marketplace, I have lumped 4 of them together which I use in my office. 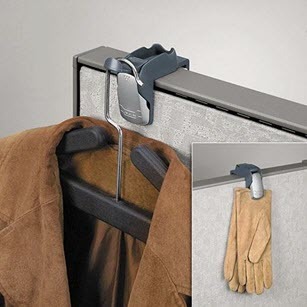 Check out these cool cubicle hangers below. I wrote an article about assembling and using Balt Cubicle Board Hangers in this article. They require minor assembly but certainly are worth it for hanging a heavy item, a sign, or even a hat or coat. The Cork Bar above was detailed in this article and I use it to hang notes from to remind me of appointments, etc. It is a really cool item that satisfies a much-needed function in a small space on my cubicle wall. There are many different types of over the panel or cubicle coat hooks available in the marketplace. Here is a link to the many different types offered on Amazon. The Fellowes Coat Hook and Clip seen above is a really versatile cubicle hanger and I featured it in this article. It is adjustable to fit any size cubicle wall thickness and it not only allows you to hang a coat hanger or your coat without the hanger but it also has a really cool clip that you can use to hang your gloves or even a calendar which is shown in the article. T-Pins! Yes, T-Pins are my #1 choice for hanging anything in a cubicle. Why? Well it's for a number of reasons. For one, they are unique in that they aren't actually meant for hanging items within a cubicle but they work beautifully! Also, they are cheap. If you buy a box they will last you probably your whole working career. I wrote an article about T-Pins here and the article includes a YouTube video of me hanging some items in my cubicle just with T-Pins. In fact, I'm going to include the video below so you don't have to go to the article to see the video. T-Pins can also hang fairly heavy pictures or posters if you use them properly. In the pictures below I show how to easily hang a fairly heavy picture on my cubicle wall. 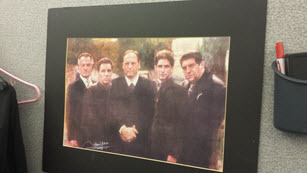 Hanging a fairly heavy picture on my cubicle wall. Keyhole slot in back of the picture is perfect for the T-Pin. Just angle the T-Pin slightly into the wall. Picture hanging on the slightly angled T-Pin! I hope you enjoyed this Top 5 list of cubicle hangers. I use them all and I hope maybe you find something here which could make life in your office cubicle a little more blissful! I am looking for cubicle poster size board that is self adhesive on both sides. Sticks to cubicle wall and can stick memos and notes on the other side. Check out this article on my site. There are a whole family of these types of products which will adhere to a cubicle wall. At the end of the article are a bunch of products that you could check out that you may be able to use for your needs. The front are not self adhesive but you could affix post-it notes etc which might do the trick for you. Thanks for sharing! Push Pins are my favorites. Yes, they work well in cubicle wall! I use lots of T-pins. Sometimes I don’t like that they are visible. Oh well……thanks for the input.